Not only the residents of this old hill town, but those who spend the summer here, will be interested to know that a movement has been started by Thomas Packard, and others, to found a historical society. Mr. Packard is one of the few remaining descendants of the first settlers of Plainfield, a town established in 1785. His ancestor came here in 1779, although he had been scouting and buying land for a few years previously. The purpose of the society is to bring together and preserve in the town, historical records and objects and all the available antiquities relative to the town since its beginning, for the benefit of the townspeople, the general public and for posterity. One of the objects of the society is to publish an illustrated history of the town with sketches and maps. The last published history of the town is that written by Charles N. Dyer in 1891. It is now time to rewrite and bring up to date the history of the town. Many relics of the town’s early history and that of its early inhabitants are still in the town and many would become available for preservation. Mr. Packard and others are storing many temporarily. An appropriate homesite for preserving and exhibiting such records, and objects of interest is very important. It should be large enough for accumulated treasures on hand in the present and in the near future; as nearly fireproof as possible, and if possible, a building of historic interest in itself. Such a building is now available. It is the old “Brick Store” on the Commons. It was erected about 1820 by one John Mack, and was operated by him and others, the last being H.S. Packard, as a store for nearly a century. It stands on “The Common” of olden days, where the town’s militia trained in the days of the Revolution and afterwards. The site is well located at the crossing of two of our main highways, both dating from early times. The building is of nearly fireproof construction, built by Plainfield bricks and in a fair state of preservation. Anyone may become a member of this society by paying $2.00 or more and anyone joining before January first, 1961 will be a charter member. To publish a history will require some money, and to acquire a building for a museum will require money also. It is hoped that this may be raised by donations, and by projects put on by the people of the town. Surely we have a worthy goal. This fine old town has certainly an interesting history as any town of its age. With its location among the beautiful and healthful hills of Western Hampshire County, its wonderful scenery, its tradition of Moses Hallock, Charles Dudley Warner, Marcus Whitman, Col. John Packard, Doctor Samuel Shaw, William Cullen Bryant; and many noted missionaries who had their roots here, and others. The fact that the early records of the town and church were so excellently kept, should be of great help in writing the genealogical section of its history. 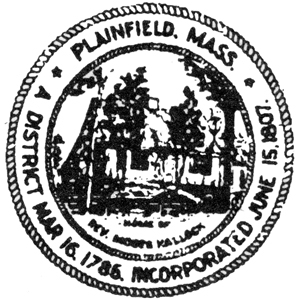 It is hoped to gain as members as many persons from all parts of our country whose roots go back to Plainfield.